Mardaani, a movie I had been long awaiting for two reasons – First, Rani Mukherjee had lost somewhere post Talash and one only read about her in gossip mills, that too mostly updates about her personal life. A comeback for an actress of her calibre had to be special. And the promos too, accelerated the curiosity! Secondly, Indian cinema usually takes a very “Jhansi Ki Rani” approach when it comes to female dominated films. Coming from a seasoned director like Pradeep Sarkar, who has mastered the art of serving the perfect feminist story (Parineeta, Laga Chunari Mein Daag), one could expect a film that met the viewer’s expectations. And true to its name, Mardaani, the movie took the box office by storm. 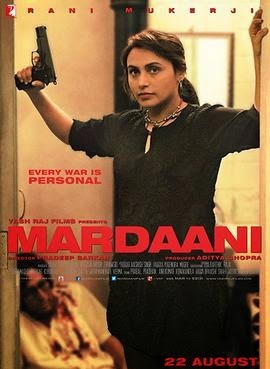 The initial buzz following its release has reached a different level with Mardaani staying afloat vis a vis the others. Since Singham returns came in a week before, there were comparisons floating around of Mardaani being Lady Singham. But if you watch the movie, the Bengal Tigress roars and impresses you with her seasoned natural acting, superb dialogue delivery and action sequences which no rosy rosy actress trending these days would have been able to manage. Pradeep Sarkar, weaves a story around the wefts and warps of human trafficking. Shivani Shivaji Roy, an honest and intelligent crime branch officer takes on the mafia when an orphan girl Pyaari, whom she treated like her own daughter falls prey to them. The officer, who believes in becoming a rat to catch a rat, and a snake to catch a snake, takes it upon herself to destroy the Lanka. The rest of the movie sees her manage a rather tough chase to Delhi and unearth the racket, with limited help from the authorities. One thing I love about Rani is the ease with which she slips into her character, be it her bold avtar in No One killed Jessica; the submissive housewife in Talash, she gets into the skin of the character. So, one shot will see her spearheading her team on a mission to catch a gangster, and the other will show her pounding her love on her niece and an orphan on the street Pyari. You may not see her serving her husband hot chapattis but like a true Indian wife you can see her pained to see her husband in trouble and standing by his side. The supporting cast has done a decent job, but it’s Rani who steals the show and you can’t help but marvel at yet another flawless performance of the actress! It was a treat to my eyes to see many familiar locations in Delhi in various scenes – Connaught Place, Lodi Garden etc. While the film keeps you totally hooked on in the first half, it gets pretty predictable towards the end and Mr. Hubby suggested we move before the ending credits to avoid the rush. But I insisted we stayed till the last scene, for I loved watching the end for Rani’s action sequences and her strong dialogues. (There is frequent use of some censored words too so you might wanna think before your kids wanna go for it). With such a movie, you cannot hope for romantic or song n dance numbers as they would dilute the flavour of the movie. However, the background score and the theme song resonates the spirit of the movie. “Khoob Ladi Mardani Woh To Filmon Wali Rani Thi..."
Here’s wishing she continues to impress her with her ever evolving acting skills! On these white rafts enjoying their flight? Oh I too wanna experience their love n care! Would they b layers of satin, or velvet when I touch them! We meet after long n I feel droplets in their tears of joy! With clouds with me in the hills i know what is heaven! 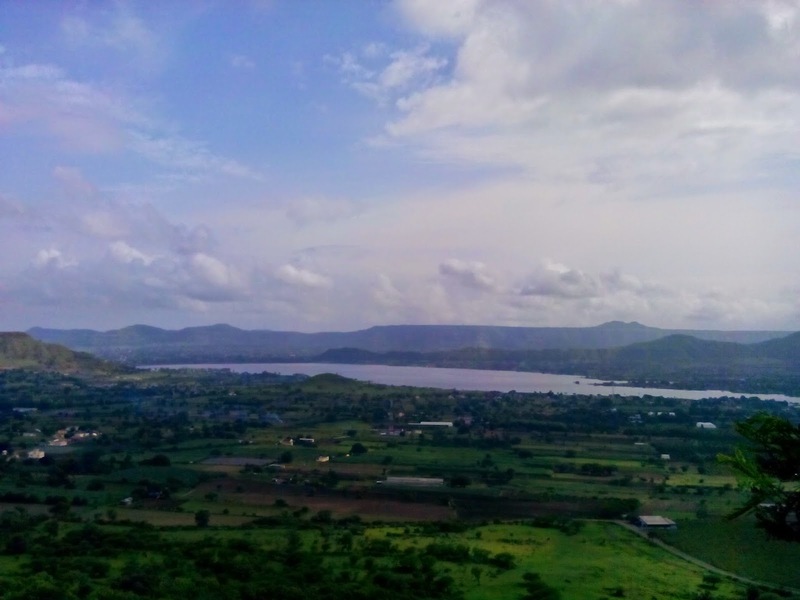 The title Humanshastra sitting in the lap of mother nature, lush green surroundings, blue sky and a bright sun smiling at you from the horizon…Oh I immediately wanted to be there! But then the only way to be there was to enter the author’s world, his book. Our relationship with nature begins in life before any other relationship gets formed. Its nature who nurtures and teaches us to live. Nature wants all its children happy, so it has given us some guidelines and laws that will help us remain in the territory of its care. But do all children respect and obey mother nature? With years adding to our lives, we get webbed in the materialistic world, and the lap of nature is somewhere forgotten in the midst of deadlines, targets, worldly pleasures and the rat race. In a world like this, the book makes us pause and reflect about our relationship with nature. We are all children of nature. But, do we act in accordance with nature? If not, why? And if change begins from us, how can we avoid the wrath of not adhering to the laws of nature? In the 100 odd pages, the author takes us back to the principles to a happy living. As you read, you realize it’s the age old wisdom that gets passed on to us during childhood. However, as we grow up, our thoughts, behavior and actions in our daily life take us on the highway to unhappiness. It’s time however, to reflect and take the right path. In order to start the reflection phase, the author, in the first few chapters throws many set of questions, forcing us to think whether our acts and thoughts are in accordance with the laws of nature. Next he quickly does a ready reckoner of these laws and how they can change our lives. And just when you understand it all, the author bridges the gap between what and why, sharing the path to happiness and satisfaction by following the nature’s path. The author crisply takes the readers through the path to self discovery. The book is like a recap to the age old wisdom of virtues we learn throughout our lives. We might know it all, but whether we remember and implement is the challenge author has beautifully handled. To avoid any confusion, and perhaps to re –emphasize, the author explains each law of nature in his own simple way, with examples. Various anecdotes decorate the book and one stops and reflects. Read a chapter, reflect, and jot down how you would apply the same in your life….that's how I would recommend reading. Jatin Bharmani is a HR professional with more than 12 years of professional experience. In 2011, he found Opteemize in 2011, which is a Human Resource Management consulting firm. 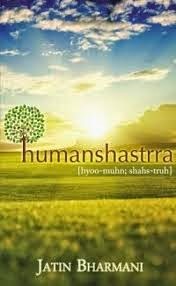 Humanshastra is his effort to create awareness about the laws of nature and how all of us can be inspired by the unseesn. This review is written for BecomeShakespeare.com. The views and opinions expressed are my own and under no obligation or influence. This is my first book review after moving to Mumbai. In the crazy pace of things which revolved around shifting, setting up new house, understanding the new office culture, new city, new people etc…a part of me inside was cribbing about the fact that I hadn’t done any book review since I had relocated a month ago. So, when Nethra from Fablery contacted me for the review, I was skeptical since I didn’t have the bandwidth to do a lengthy book and do a fair review. However, when she sent me the teaser, the first thing that caught my attention was the number of pages – just 120! While it created some doubts whether the author would have done justice to the book, it also created curiosity in my mind about the ability to tell a story so crisp! Honestly, I was also confident I would be able to do justice to the book considering my hectic schedule in the new city. And now, I can say the book truly cooperated with my busy state of affairs. The book arrived rather early and was actually received by the carpenters who were doing some last minute work before we shifted to the house! “Have I picked up a horror story?” I wondered, since I have a not so good opinion about the Indian style of dealing with this genre. To read or not to read was the question, but the curiosity was to be killed. What would you do if you are marooned in a city where everything from the language to people is selfishly strange? You look for short breaths of comfort that energize you to take on the new challenges. Well, that’s how it went for the narrator, who was stuck in Madras for his stint as a bored entrepreneur of a software start up. Being the promoter meant there was no escape from the place till one fine day, a colleague suggested him to explore the country side to help escape the monotony. As if the bird in the narrator was freed from the cage! He created his own world for the weekends, when he would pack his bags and explore some offbeat place which appealed to him. Not much research, just pack your bags and set out on trail, was his funda. The arrangement was working out fine. He was exploring new places, culture, mindsets every weekend and would return to his monotonous job rather energized. Off beat places also meant cheaper boarding and privacy. The arrangement was working well for him till one fine Saturday evening he reached the bus stop and as usual after checking out the names on the buses, chose the destination he had never heard of before. When something bad is about to happen, nature gives warning signals – the conductor looked utter puzzle to see him boarding the bus for that particular destination. But the narrator turned a blind eye to the signals and hopped on to the bus going that way. Yet, he was in no mood to let local superstitions play spoilsport. Joined by a tea vendor and the son of a priest for company, he decided to visit the temples as just a tourist and perhaps look for free food and lodging. Food he gets in plenty, but even a goat who is to be sacrificed is fed in plenty before being bludgeoned to death. In his effort to show respect to the local customs, he bowed before the altar of sacrifice, offering himself to Luganar, the evil. What could have been a scenic sightseeing tour thus becomes a tug of war between beliefs, science, logic, the good and the bad. While he had messed up with Luganar, the Devil, only Palaghar, the good God could save him from this mess. But was the logic and education in his mind allowing him to believe all this? Or were things becoming too much for Luganar to offer an encounter? Stuck between the good, evil and beliefs, did his logic surrender to the power of the evil? Or the good cleansed the bad? Well, you got to pick up the book, for I offer no spoilers. It’s a quick and convenient read and you can finish it in one sitting! No drags to a reader’s delight! The language is simple and you can visualize scene by scene. The author is able to keep you hooked till the climax! 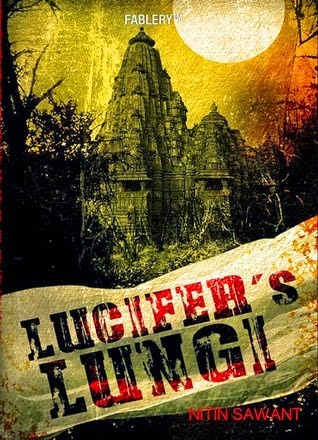 So in case you are looking for a quick read on a rainy afternoon with a cup of coffee, Lucifer Lungi is certainly a book to be shortlisted! Nitin Sawant has tried to make a living by being a software programmer, engineer, stock market analyst, copywriter, journalist, tele-shopping expert and jewellery designer at various stages in his life. He’s travelled far and wide across the world, and has led a nomadic life for past 20 years. This gives a unique perspective to all his tall tales and offers a distinctive colour to his writing. This is a sponsored review for Fablery. The views and opinions expressed are my own and under no obligation or influence. This Mumbai Mayanagri never leaves an opportunity to amuse me, be it for the simplest of things. You all will find the incident I share today really funny, especially if you are from the North. 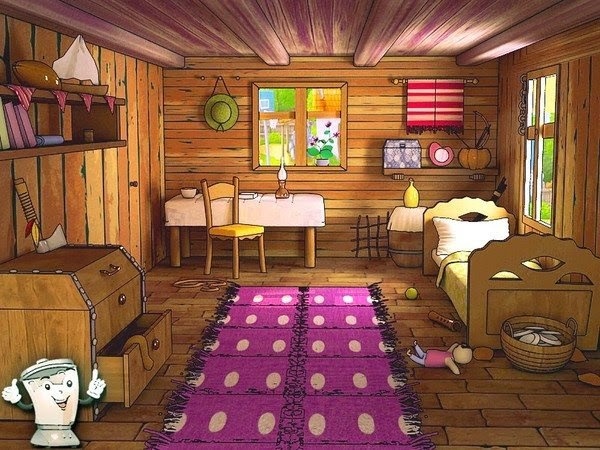 Well, if I ask you what is the meaning of the hindi word “kamra”, what would your answer be…A room, right? You must be wondering I have lost it today! Wrong answer if you are in Mumbai for here, "kamra" signifies a full flat! Can you believe it? Even I couldn’t digest it the first few times I heard this rather funny usage. For a moment, I felt like the passenger who has been downgraded from business class to economy at the last moment and whispered to Mr. Hubby “What is he talking about? He thinks we will shell out this much money just for staying in one room?” Mr. Hubby then explained to me the Mumbai version of Kamra! And the usage is not just confined to verbal mention. I found several flats in my society mentioning “Kamra no. …”on their name plates! 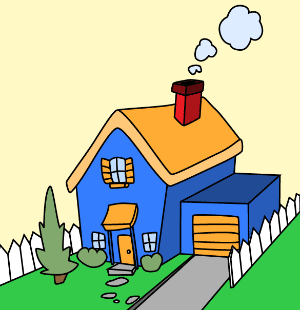 We Dilliwallas are used to living king size, so a house is usually a kothi, a flat is a 2/3/4 bhk and a kamra usually indicates a single room. But here kothi becomes a bunglow, and flat straightaway gets downgraded to Kamra! Anyway, I have undivided love for all the Kamras in my flat. But yes, I miss the spacious balconies, terraces and gardens Dilli has to offer. No matter how much I may have cribbed about my city, the long distance relationship has its own charm, for distance deepens the bond of love. So my big city with a big heart, I miss you! 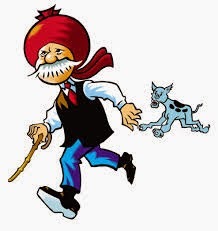 When I heard about the demise of famous cartoonist Pran this morning, the image of Chacha Choudhary came in front of my eyes – that characteristic moustache, red turban, black waistcoat, thin frame, walking stick, agility in his walk and talk. 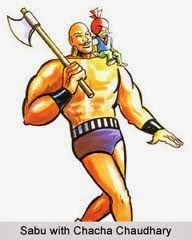 Somehow I always related Pran with his most famous character – Chacha Choudhary, for like Chacha, Pran too, as the grand old man of Indian Comic industry spread happiness along with the right messages for the younger generation through his comics. 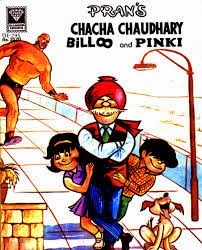 Look back in your childhood and it is unlikely that you will remember loving any comic more than Chacha Choudhary, Pinki and Billu! 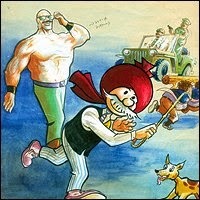 In fact I still can’t recall any other Indian comic I would have read other than the ones dished out by Pran. My addiction for these comics knew no bounds and this often invited spanking from mom when she caught me reading comics hidden in textbooks, right before exams! Her usual statement was “If you have this addiction for your studies, the scene would be much better.” As soon as the exams would end, I would rush to my cousin’s place as he had a cardboard carton full of these comics and we would exchange the ones we had read! While foreign comic characters too were a hit with us, Pran’s comics had a special place in our hearts since they came from our own heartland and were characters from among us. The wise old man of Indian comics, Chacha never failed to prove that his mind worked faster than computer. A sharp mind and a gentle heart, he was someone we adored, respected and looked up to. He was the common man hero, who won with his mind and not violence. While Sabu was the volatile one of the duo, Chachaji would always use his presence of mind. Every time he would foil the plans of thugs, it would be in a way that would make us laugh and marvel at the wit and common sense of a common Indian man. While he was tough with thieves and goons, inside the house, he surrendered to the home minister, Chachi. Incidentally, Chacha Choudhary never locked his house when he went out and still managed to save his house from being burgled! 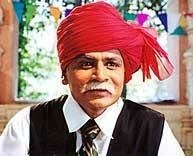 When the TV channels decided to convert Chacha Choudhary into a TV show, Raghubir Yadav was the apt choice for he so so much resembled the image of Chacha we all have in our minds. Chacha’s large heart got him to adopt Rocket, a stray dog. The docile Raaket (the way they used to mention his name in the Hindi version) didn’t spare the thieves whenever they attempted foulplay. No premium pedigree, this very Indian feeble Rocket was India’s answer to Tintin’s canine companion. Shrimatiji was the reason why my brother and I picked up women’s magazines, for usually the Shrimatiji strip found its place on the last page of women’s magazines mom used to read. Shrimatiji was the smart, progressive woman of the 80s who learnt the tricks of the changing times and always had the last laugh. Billu and Pinki were the gennext kids of the 80s who preferred to spend their time playing pranks and solving cases rather than glued upto facebook! Though I preferred reading comics where they both appeared along with Chacha Choudhary, it was fun to read about Pinki’s display of bravery and smartness along with her pet squirrel, Kut Kut. With growing years, Nancy Drews, Hardy Boys and then Sidney Sheldon replaced my bookshelves but just like school friends have a special place in our heart, no matter how many friends we make in life, Pran’s comics are an indispensable part of my childhood. 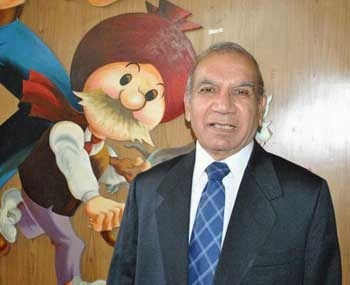 A big salute to the Walt Disney of India. While I may have read the comics purely for fun back then, now, as I write myself, I understand the craft of this genius who gave us the heroes from amongst the common men and women. He was often quoted as saying “"If I could put a smile on the face of people, I would consider my life successful"
RIP Pran Sahab and thanks for giving us more than just smiles.